In the Opal Cliffs area near Pleasure Point, we are between 38th and 41st Avenues. 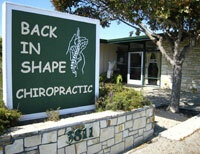 Look for the green “Back In Shape Chiropractic” sign. We have ample parking for you. Bicycle racks are behind our building and the bus stop is nearby. Please plan on arriving early for your appointment.